eligion. Politics. Rebellion. Boston�s pedigree was forged back in England in the midst of religious dissension, where Puritans and Pilgrims sought religious reform, and Cavaliers and Roundheads vied for political power. The question isn't where did Boston get its name � but how. Five years after the Battle of Hastings (1066) where William the Conqueror subjugated much of England, a parcel of land in Lincolnshire was gifted to one of his noble supporters from Brittany. A church was built � often the precursor to what we would call �development� today. It was named after an orthodox saint with the unorthodox name �Botolph� that preached throughout England in the 7th century. Saint Botolph (ca 610 - 680) began his religious training as a monk in Gaul (modern day France). In 654, he returned to England and founded the monastery of Ikanhoe in East Anglia. No, not Ivanhoe - that's a novel by Sir Walter Scott. Coincidence? I think so. Tradition has it that the place came to be called "Botolphston" � either from "Botolph's stone" or "Botolph's town" � which was later contracted to "Boston." Remember, these were the same wily bunch of seafaring people who gave us the terms fo'c'sle (foke-sol) for "forward castle" and bo's'n (bo-sun) for "boatswain." With that in mind, I can believe "Boston." Or is it B'st'n? Unlike tradition, however, evidence suggests that Boston was not the site of St.Botolph's monastery. 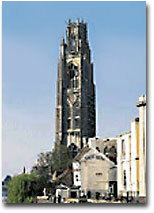 It is more likely that Boston started in the 10th century as a small Saxon village around a wooden church. The existence of this church was recorded in the Domesday Book in 1086. As seen in the photo, the church, known as "the stump," has improved considerably from its humble wooden beginnings, though now suffers from a really bad nickname. During the Middle Ages, the village grew to become the second most important port in England, enjoying great traffic from Hanseatic traders of northern Europe. In 1545, the town was granted it's charter, which allowed the Lord-Mayor to dress-up in elaborate robes, wear a large black velvet three-corner hat, and sport the town seal suspended from a large gold chain. By the 17th century, Boston had become a hotbed of religious nonconformism, inspired by figures such as John Foxe and John Cotton. Many Bostonians, including Cotton, relocated to Massachusetts. In fact, about 250 people left Boston, which was about a tenth of the town�s population, to find new homes in Massachusetts over the next few years. Furthermore, throughout the emigration period of 1620-1640, England lost over 20,000 people to Massachusetts. But why? Why did so many people want to leave England? Didn't they know about Massachusetts' winters? In October of 1517, Martin Luther nailed his 95 theological theses (declarations) to the castle door in Wittenberg, Germany. Hoping to spark a little earnest discussion, Luther got a revolution instead, or more accurately, a Reformation. That same year, John Foxe was born. Who, you say? Well if you were an ardent reader back in 1563, or knew someone who was, you would know that John Foxe published his work called �The Book of Martyrs.� It was a smash hit among those in England dissatisfied with the Church, known as nonconformists, of which there were a considerable amount. Many had been waiting since Henry VIII for a real opportunity to reform the Church. Ah, that �great reformer� of the Church, Henry VIII. Well, he wasn't really a reformer; more of a hijacker. You may remember that Henry VIII, a Tudor, was experiencing problems with his marriage, as well as political difficulties, such that in 1533, he convinced the Bishopric of Canterbury to annul his marriage to Catherine of Aragon. Not satisfied with his quick, Las Vegas-like annulment, Henry saw this as an opportunity to get rid of his biggest competitor to wealth and land � the Church. A year later, Henry had Parliament make�him the �Supreme Head of the Church in England.� This immediately severed all ties with the Roman Catholic Church, and made him the ultimate power in England. Think of it as a hostile take-over with Henry as the new CEO. The Church and the State were now one. This was very good news to the reformers, for they wanted to overhaul both institutions to make them more biblically-based. This just made their task that much easier. The reformers wanted all the folderol removed from the Church that they believed was unnecessary, like ornate ceremonies, opulent vestments, and the ever-popular Indulgence of the Month Club. Similarly, the State could work best if it used the Bible as a template for such things as justice, so the reasoning went. During all this �reformation,� regular and somewhat subversive theological meetings were being held in the White Horse Tavern in Cambridge, England. All good revolutions seem to begin in bars. Among those present over the years were Thomas Bilney, Hugh Latimer, Nicholas Ridley, and Thomas Cranmer � all of which were later martyred for their beliefs. A rather sobering thought. Henry had no particular desire to "reform" the theology of the church, since it would now more or less serve him. However, there were many reform-minded people that did care - particularly those frequenting the White Horse Tavern for Theological Thursdays. Unfortunately for them, such desires found little royal support during Henry's reign. After the King died in 1547, his nine-year-old son Edward assumed the throne. Children would often rule through officials called regents, much like agents chaperoning rock-stars today, although with considerably less mess.� The two regents that aided Edward were the Duke of Somerset and the Duke of Northumberland, both of which had some degree of sympathy for the reform movement's vision. The rush was on for the �purification of the church and the state� between 1547 and Edward's death in 1553. The next Tudor on the throne was Mary I Tudor, better known as "Bloody Mary." Mary wanted nothing more than to turn back the clock and return England to the Roman Catholic fold, no matter what the cost. So she pulled a Crazy-Ivan, doing an about-face, and set the ship of State careening back towards Catholicism. The result was a massive emigration of Protestant exiles to Europe, settling into pockets in Geneva and Frankfort. With them went John Foxe, who would continue to drink deeply of the dreams of Church reformation, presumably at the White Horse Tavern's counterpart somewhere in Switzerland or Germany. Then, in 1558, good news for the reformists: Mary I died, and her Protestant sister Elizabeth reversed the earlier tide towards Catholic reunification, sending the �migr�s back home in droves. Crazy-Ivan number two. From the pen of John Foxe, the reformers would demand the pure practice of both the Monarchy and the ecclesiastical leaders, directing all English affairs sola Scriptura � according to the Scriptures alone. Well, with such momentum, what could possibly stand in their way? The next Queen of England. Just when they saw light at the end of the tunnel, Queen Elizabeth I surprised them. Elizabeth I�s desire was for political stability and order, not extremism � especially the kind which the theological heirs of those White Horse participants seemed to be. The State and the Church should, in her view, be broad and inclusive and should base its life on tradition and reason as well as on the teachings of Scripture. As a consequence of her moderate approach, the word "Puritan" as it's associated with the nonconformists became a name of ridicule during the reign of Elizabeth I. By 1570, the nonconformists had split into two factions: those that wanted to work within the system, and those that had had enough of it and wanted to leave. And so they did, eventually. Elizabeth I died in 1603, and was replaced by James I, first from the Stuart line. The Stuart line originated from Scotland, and being from the north, they were natural allies to the Cavaliers - the supporters of the Monarchy, associated with the Nobility, peasantry, and Episcopalians. James enjoyed the Monarchical power, the extravagant spending, and the belief in the divine-right of kingship. James didn't like Parliament, Sir Walter Raleigh, or Puritans. Over time, his relationship with Parliament eroded to the point where they simply wouldn't give him anymore money. He had bungled foreign policy, inflation was everywhere, and gave out peerages like cocktail napkins. Politics spilt over into religion, and once again the ship of State made a U-turn back to Roman Catholicism. Crazy-Ivan number three. Though many considered him a bit of a paranoid twit, he did manage to commission an Authorized Version of the Bible, printed in English in 1611. In one of those many ironic twists of history, an English Bible was probably on the Puritans' List of Things To Do considering their strong belief in individual study and practice of the Scriptures, not to mention scholarship in general. Making the Bible so accessible to the masses was a great start. However, it was clearly not enough. During his reign, the lines became more distinctly drawn between the Episcopalians and Cavaliers of the North and West counties, and the Puritans and their sympathizers in Parliament (later to be called "Roundheads") of the richer South and East counties. In 1607, a group of reformers - the ones that had had enough of the Church, the King, and the warm beer (later referred to as the Pilgrim Fathers) - put enough shillings together to hop a ship from Boston, England to the Netherlands. This was risky stuff, because it was illegal to leave England without the King's permission. As they boarded the ship, their minds were on the adventure that lay before them. The captain of the vessel had other things on his mind. He turned them in to the local authorities, and they were thrown in jail. After a brief stay, they tried again in 1608, and this time succeeded. That is to say, they reached the Netherlands. After 12 years, they decided the Dutch people weren't the right kind of people, and split for the New World. As the Puritan movement gained a voice in the words of Foxe's Book of Martyrs, so the "Pilgrim" movement could be traced to Robert Browne's book, Reformation Without Tarrying for Anie (1580). Browne shared Foxe's vision, but after more than a decade of seeking reforms within the English church, became disillusioned. 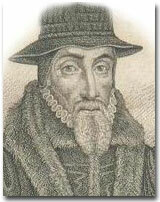 He "separated from" the English church, and in 1581 started his own congregation in Norwich, England. The Puritans emigrated to the Boston, Massachusetts area throughout the 1630�s and beyond, whereas the Pilgrims settled in Plymouth, Massachusetts from the 1620�s onward. The Boston and Plymouth colonies were distinct political and religious entities, until Charles II and the government combined them in the late 1680's. Relations between them were generally friendly, but members of both groups were quite clear concerning the differences between them. Puritans wanted to remain a part of the English establishment, working for biblical reform from within. To them, the purpose of their new colony was to be a biblical witness, a "city on a hill," which would set an example of biblical righteousness in Church and State for Old England and the entire world to see. Pilgrims were in no mood to wait. They wanted to achieve "reformation without tarrying (delay)," even if it meant separating from their church and their nation. While they continued to think of themselves as English, their emphasis was on their new political and spiritual identity. In 1625, James I gave up the throne, and his ghost. His son, distinguished in childhood by his strong will, became Charles I. He kept frightfully busy using that strong will of his: he mismanaged affairs (a chip off the ol' block), got into a cantankerous battle with with Parliament, and brought on a civil war that would result in his own execution. In his spare time, he was known to like horses. Charles pushed England even a little further back towards Catholicism than his father had, chiefly because he hated the Puritans even more. Parliament, now an even bigger thorn in Charles' side than his father's, was summoned and dissolved three times during 1625 - 1629. Parliament should have been summoned every year or so in order to take care of the Kingdom's business. During the next eleven years, no King of England would ever enjoy this kind of absolute power again because Charles didn't bother to summon Parliament. Just as well, since they weren't about to give the King anymore money. Fine by Charles - he financed his reign by selling commercial monopolies (today, we call them "franchises") and extracting ship money - a fee demanded from towns for building naval warships (today, we call that "extortion"). One such commercial monopoly was the Massachusetts Bay Colony. You were wondering when we'd get back to Massachusetts, right? Hold on, it's coming up soon. To add gasoline to the fires already burning, Charles married a devoutly Catholic French princess that further angered the increasingly Puritan Parliament. Her Catholic friends held sway at the royal court. She interfered in the affairs of state, and put her wants above the needs of the Kingdom. And you thought the Beatles had it rough. All right, back to the Puritans. Things got worse for nonconformists under Charles I. Sure, the Pilgrims got to leave in 1620, but what about the poor Puritans, incensed by the tide turning evermore to the Catholic leanings of the Church-State? As mentioned before, it was illegal to leave England without the permission of the King, and that was fairly unlikely if for no other reason than spite. However, fate finds a way - even if it's a legal loophole. On March 4th, 1629, the Massachusetts Bay Company was given its Charter by Charles I. Although it was a commercial company interested in cultivating trade in the new colony, the leading promoters of it were Puritans intent on creating a church free from outside interference. Apparently, they didn't write that down on their application to the King. When King Charles granted a colonial charter to the Massachusetts Bay Company, the document failed to specify that the governor and officers of the company had to remain in England. You can read it for yourself. The Puritan stockholders took advantage of this omission, and moved the whole company and its colonial government flock, stock, and barrel to America. They would then establish a biblical community - "a holy commonwealth" - as an example to England and the world. The Puritans would finally get to leave England, under the nose of the King, all because of a legal loophole. The Massachusetts Bay Company would ferry thousands of Puritans to America over the next few years. On August 26th, 1629, a dozen shareholders from Boston, Lincolnshire, including John Winthrop and Thomas Dudley signed a contract to "inhabit and develop New England", assuming of course they'd be allowed to govern the new colony themselves from Massachusetts. Seemed reasonable. The first governor of the Company was John Winthrop, Dudley was made his deputy, plus there were the usual entourage of bureaucrats, assistants, etc. Puritan society was very understandably excited about the venture. Many licenses to migrate were applied for and granted, obliviously without background checks. By April 1630, Winthrop's great fleet of eleven vessels was ready to sail from Southampton carrying the first Lincolnshire contingent aboard the flagship Arbella. Apart from Winthrop himself, these included Thomas Dudley and his family, Anne Bradstreet and her husband Simon, and Lady Arbella Johnson and her husband Isaac. Although ill, John Cotton traveled to see them off, not passing up the opportunity to give a sermon for the whole company. By mid-July of 1630, Winthrop�s fleet had reached the shores of Massachusetts, but their first landing at Salem was a disappointment as the settlement was short of food and not able to support another thousand inhabitants (much like cars today). Though they found their way to the mouth of the Charles River, their health had deteriorated so badly that at least 200 had died. Across the Charles River, William Blackstone, a former clergyman, was living an isolated existence as a trapper on the Shawmut Peninsula - the original land mass of Boston. Word came to him from Indian friends of the difficulties his fellow countrymen were having. He sent a message to John Winthrop advising him that the Trimountain hills on his side of the river were far more suitable for settlement. Winthrop, who had been at college with Blackstone (as unbelievable as that sounds), went to see him and it was this meeting in 1630 that really marked the foundation of the city of Boston. Within the next few weeks several small wooden houses were built by the migrants and at the suggestion of Thomas Dudley it was decided that the new settlement be called Boston after its English namesake. Remember, the Puritans did not want a break with England, just to create an example of what could be if England followed their example. Hence, they'd fashion their Boston in their own image, so to speak. Over the next few years many more Lincolnshire migrants arrived. Indeed, a memorial stone in St.Botolph's Church commemorates the five Boston men who became Governors of Massachusetts, those being Thomas Dudley, Richard Bellingham, Francis Bernard, John Leverett and Simon Bradstreet. So that's where, and how, Boston, Massachusetts got its name. From Boston, to Boston. You can think of the two Bostons as opposite ends of the same conduit stretching from the religious and political upheavals of England to the hope and promise of the New World. Not all legal loopholes have worked out quite so well. While the Massachusetts Bay Colony began to thrive, Charles' problems went from bad to worse. A problem back home in Scotland ended Charles' 11 years of sole rule and brought about a civil war upon England. Charles had decided that the Scots needed a new prayer book. "What's the harm in a new prayer book? The Scots will love it." Instead, the Scots rebelled. Due to the chronic lack of proper funding, Charles' army was no match for the surprise resistance. The King called two Parliaments, one short, one long, but they could reach no agreement. The Queen, of course, could be counted on to have an opinion: why not begin arresting members of Parliament? Charles went to the House of Commons - the first King to have ever done so - and tried to arrest John Pym, the leader of Parliament and four of his closest allies, but failed to do so as they had escaped the day before. Embarrassed and in a snit, Charles ventured north to raise an army and declared war against Parliamentary forces at Nottingham in 1642. Religious and economic issues added to the differences between the supporters of the Monarchy (Cavaliers) and the supporters of Parliament (Roundheads). Roughly speaking, Cavalier backing came from peasants and nobility of Episcopalian roots, while Roundhead backing came from the emerging middle-class and tradesmen of the Puritanical movement. In terms of geography, the northern and western counties aided the Cavaliers, with the more financially prosperous and populous southern and eastern counties supported the Roundheads. Not unlike the American Civil War, the Roundheads, with more money and more population from which to draw, were destined to win the battle. In 1645, Oliver Cromwell and his New Model Army at Naseby easily defeated the Cavaliers. A year later, Charles surrendered to Scottish forces, which turned the King over to Parliament, along with a considerable amount of unused prayer books I should think. In 1648, Charles was put on trial for treason. A tribunal, by a vote of 68 to 67, found the King guilty and ordered his execution in 1649. He was beheaded. After that, Oliver Cromwell dismantled government and many governmental institutions, in an almost Soviet-style of takeover. The Puritans were now in power, and the State swung 'round again towards Puritanism and reform. Crazy-Ivan number four. After many failed attempts of governing, Cromwell finally came up with the ultimate solution: he would become "Lord Protector of the Realm," or in effect King. Upon his death, his son Richard became the new Lord Protector of the Realm, and through his inability to do a better job, the Monarchy was restored about a year later, giving England the restoration of the House of Stuart with Charles II: The Sequel. Parliament had severely restricted the powers of the King, however, the people were happy that they had a King again... as long as he behaved. Conflicts with the Dutch caused Charles to form an alliance with France that supposed he would reintroduce Catholicism back to England "at an appropriate time." However, it never happened. No Crazy-Ivan this time, as Charles II did nothing to steer the State anywhere in religious terms. But that's all English history. At that point, Massachusetts was a thriving colony, well on it's way to forge it's name in history, with its Boston leading the way. Brandon Gary Lovested is a contributing writer to iBoston, as well as its Webmaster.